Wireless low-voltage DMX-controlled 6-channel dimmer for theatre and motion picture. Control LEDs & lamps in small props, costumes, and more. Part of the RC4Magic S3 2.4GHz platform with the RC4Magic Lifetime Warranty. The RC4Magic S3 DMX6dim is a compact, easy to use, digitally secure, battery-powered wireless DMX dimmer with an unprecedented six channels of power handling. It smoothly dims LEDs and lamps, controls small DC motors with wide-range speed control, and provides many features to optimize color and appearance for a variety of theatre and motion-picture applications. 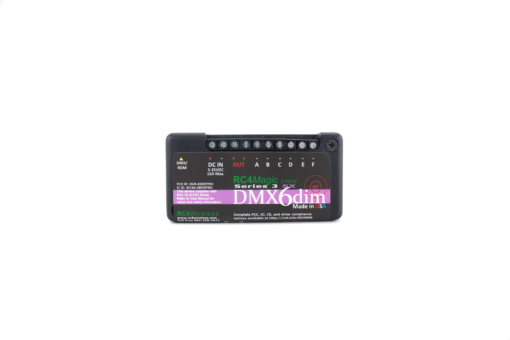 The RC4Magic Series 3 system, including the DMX6dim, is covered by RC4Magic Lifetime Warranty, the only warranty of its kind in the industry. RC4 Digital Persistence™ A carefully engineered thermal model makes LEDs fade up and down like incandescent and halogen lamps. RC4 ColorMatch™ Match color palettes and white-balance different LED sources from different manufacturers. RC4 Flkr Effects Engine™ Create personalized visual effects, including fire, welding spark, and much more. RC4 HotPatch™ Signal path routing of RC4 features: route the Flkr engine to the HSL controller for example, and much more. Projects and productions in the USA, Canada, Brazil, Australia, and New Zealand should consider our RC4Magic-900 system. The 900MHz band is far away from WiFi, Bluetooth and other 2.4GHz wireless technology. For worldwide use in all markets, the 2.4GHz RC4Magic system is recommended. 100% compatible with RC4Magic Series 2 2.4GHz technology!